Your Humble Narrator went to the Prince Charles Cinema off Leicester Square for the launch of the second Goodies DVD compilation, picking up a copy of said DVDs. The launch consisted of a screening of two of the episodes on the discs (The Movies and Bunfight at the OK Tearooms); not my absolute favourites from the compilation (that'd probably be South Africa or Radio Goodies), but enjoyable anyway. After the screening, the lights went on and the three Goodies took their seats on the stage. Tim still looked like Tim Brooke-Taylor, only without the Union Jack waistcoat (maybe he'll wear one during the upcoming Australian tour; who knows? ), and Bill looked like an older version of his younger self. Graeme, however, was nigh-unrecognisable without his trademark sideburns (when asked by a member of the audience whether he'd grow them for the tour, he said he may buy a pair to wear). 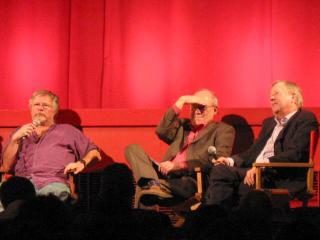 Anyway, the Goodies answered questions from the audience. Some points that emerged from the session: there is a third 8-episode 2-DVD set planned, for later this year, by when, it is hoped, all the popular and interesting BBC episodes will be available (the Goodies reckon that there are 24 that fall into this category), and possibly some episodes from the final ITV series. Some episodes may not make it to release, due to licensing issues (apparently Michael Jackson is refusing rights to some Beatles material in Goodies Rule OK). The Goodies are about to embark on an Australian performance tour; one audience member asked whether they'd do any UK shows; they said that it's less likely, given that the BBC hasn't screened any Goodies episodes for a few decades, cutting down on the potential following. So it looks like the Aussies reading this should count themselves lucky. The DVD itself is pretty good. It has eight episodes, and also a good deal of extras. I get the feeling that while the first one was made (relatively) quickly and cheaply, its sales exceeded expectations, resulting in more being put into the second one. As well as the episodes, we get several shorter sketches from other shows, commentary tracks, and PDF files of the scripts, in various revisions, not to mention a somewhat fancier animated DVD menu. The DVD is listed as Region 2, though the first one (which was also thus listed) was Region 0 (i.e., playable anywhere); no idea whether this one is. It's also coming out in Australia in a month or so, and will probably be somewhat cheaper there. I've generally found that English people look at you a bit funny when you mention the Goodies, and eventually say "oh...yes...i think I remember it from a long time ago..."